Gradual biological impairment of normal function, probably as a result of changes made to cells (mitotic cells, such as fibroblasts and post-mitotic cells, such as neurons) and structural components (such as bone and muscle). These changes would consequently have a direct impact on the functional ability of organs (such as the heart, kidney and lungs), biological systems (such as the nervous, digestive and reproductive system) and ultimately the organism as a whole. Normal ageing is that which occurs without disease. ‘The Greying of the Nations was a common phrase that described the process of a significant worldwide increase in the population , a large proportion of who are older adults. In recognition of this increase, 1999 was designated by the United Nations as The Year of the Older Person. The expanding populations are impacting on global resources and economies given the cohorts out of work (children or retired people) compared to those in work. Governments are supporting increasing amounts of research to investigate their older populations to use results to provide / estimate the resources required to sustain as healthy a population as possible. The World Health Organisation is making "ageing well" a priority with information and research evidence published on its site: Ageing and Life Course. There are recognised age differentials between mortality in the developed and the developing countries, however on average, the older adult group span a 20 - 30 year period. The need to survey populations for census work and research has led to an arbitrary division of this group into three ages of ‘old’, based in part on retirement ages, and in part on the development of co-morbidity leading to frailty. Defining cut off points for each "age" has been challenging and remains without consensus with researchers suggesting different cut offs. As populations age, it will be of interest to see if these age bands alter. Entering old age: People from 50 to the official retirement age who have completed their career. They are supposed active and independent and many remain so into late old age. Goals of health and social care policy: To promote and extend healthy active life, and compress morbidity (the period spent in frailty and dependency before death). Transitional phase: A group in transition between healthy, active life and frailty, often occurring in the seventh or eighth decades, but can occur at any stage. Goals of health and social care policy: To identify emerging problems pre-crisis, ensuring effective response that prevents crisis and reduces long-term dependency. Frail older people: A vulnerable group due to health problems e.g. stroke or dementia, social care needs or a combination of both. Frailty often experienced in late old age, so services people should be designed with their needs in mind. Goals of health and social care policy: To anticipate and respond to problems, recognising the complex interaction of physical, mental and social care factors which can compromise independence and quality of life. Human life expectancy has increased dramatically, as can be seen in the resources above. The figures from the United Nations studies show that the percentage of the global population aged 60 years or over increased from 8.6 % in 1980 to 12 % in 2014 and is projected to rise further to 21 % in 2050. Each country records its growth in populations differently. For example, in the UK, the first documented case of a 100 year old was in 1800 compared to the 11,000 centenarians recorded in the 2001 UK Census - the fastest growing section of the UK population (Figure 1). 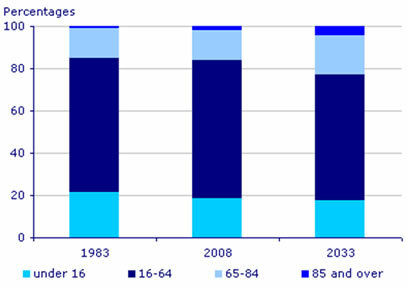 Figure 1: Fastest increase in the ‘oldest old’. Life expectancy at birth reflects the overall mortality level of a population by providing a summary of mortality pattern across all age groups in a given year. It has increased rapidly since the onset of industrialisation and modernisation, prior to which life expectancy averaged 30 years. In 2016, however, life expectancy at birth for both sexes globally was 72 years, with a span of life expectancy of 52.9 years (Lesotho) to 84.2 years (Japan). Around the world, women live longer than men whilst wars and disease account for differences between countries. Evidence from longitudinal studies demonstrates loss of independence from acquired disabilities with a gradual change toward sedentary lifestyles. This insufficient physical activity contributes to disability impacting on the use of social services and healthcare resources. A series of six articles on Ageing has been written in The Lancet to highlight what they call "a neglected area in the health sector and in social and economic-policy development". The papers address issues related to mortality, morbidity and disability, wellbeing, and potential health-system responses. For physiotherapists working with the older population, one goal is the facilitation of an individual's later years to be active and a time of good health, although for some people it is a period of loss of health, wealth and status due to retirement from work, or loss from bereavement. 1. In developed countries, a decrease in population life expectancy is predicted. This is due to a combination of sedentary lifestyles and poor diet choice increasing the likelihood of high-risk diseases. These include heart disease and diabetes or stress related and mental health disorders. What is your experience or thoughts about this statement? You may wish to read a Blog by Josh Mitteldorf called ‘Playing the game for a longer life’ to help you debate this issue. 2. Evidence (mainly literature about musculo-skeletal physiotherapy or from monitoring demographics of hospital readmissions) illustrates a correlation between poor outcome from intervention and people in the lower socio-economic sectors of society (includes the older population). In striving to provide evidence of efficacy, at what point should we consider whether our input to such groups of our population is ineffective? Think about these both in terms of value through satisfaction of the individual receiving therapy, as well as the cost, given our finite resources of numbers of therapists and budget? Evidence (mainly literature about musculo-skeletal physiotherapy or from monitoring demographics of hospital readmissions) illustrates a correlation between poor outcome from intervention and people in the lower socio-economic sectors of society (includes the older population). In striving to provide evidence of efficacy, at what point should we consider whether our input to such groups of our population is ineffective? Think about these both in terms of value through satisfaction of the individual receiving therapy, as well as the cost, given our finite resources of numbers of therapists and budget? Life Expectancy by Max Roser (2015). United Nations Global Health Observatory (GHO) data pages which give health data and general statistics about each country. The Gapminder graphic which illustrates the demographic changes of global populations over the age of 60, and their pattern of growth from 1950 to a predicted older population in 2050. ↑ Hayutin AM. The graying of the global population. Public Policy Aging Rep. 2008; 17(4): 12-17. Accessed 26 September 2018. ↑ Warner DF, H.Brown TH. Understanding how race/ethnicity and gender define age-trajectories of disability: An intersectionality approach. Social Science & Medicine. 2011; 72 (8): 1236-1248. ↑ World Health Organisation. Health situation and trend assessment: elderly population. Accessed 26 September 2018. ↑ World Health Organisation. Health statistics and information systems: Proposed working definition of an older person in Africa for the MDS Project. Accessed 26 September 2018. ↑ The CALAS Team at Tel Aviv University: Cohen-Mansfield J, Shmotkin D, Blumstein Z, Shorek A, Eyal N, Hazan H. The Old, Old-Old, and the Oldest Old: Continuation or Distinct Categories? An Examination of the Relationship between Age and Changes in Health, Function, and Wellbeing. Int J Aging Hum Dev2013; 77 (1): 37-57. ↑ Department of Health (2001). National Service Framework for Older People. London, HMSO. Accessed 26 September 2018. ↑ Lutz W, Sanderson WC, Scherbov S. Global and regional population ageing: How certain are we of its dimensions? Population Ageing. 2008; 1 (1): 75-97. ↑ 9.0 9.1 United Nations Global Health Observatory. 2016. Life Expectancy. Accessed 26 September 2018. ↑ Marmot A, Ucci M. Sitting less, moving more: the indoor built environment as a tool for change. Building Research & Information. 2015; 43(5): 561-565. Accessed 26 September 2018. ↑ McPhee JS, French DP, Jackson D, Nazroo J, Pendleton N, Degens H. Physical activity in older age: perspectives for healthy ageing and frailty. Biogerontology (2016) 17: 567. Accessed 26 September 2018. ↑ Verbrugge LM, Jette AM. The disablement process. Social Science & Medicine. 1994; 38(1): 1-14.